The Nail Technician Program is designed to give the student an introduction to the theory and concept of nail care. It prepares the student with the basic knowledge and skills to successfully compete in a professional job market. The objective for the nail technician program will be evaluated on an annual basis. 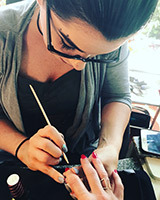 The Nail Technician Program offers the student an extensive education in manicure and pedicure technique. It provides the student with the latest advances in linen, silk and fiberglass wrappings. Students will be instructed in the proper application of acrylic and gel nails. Safe usage of a nail drill will be emphasized.